Always a tough one and Today was no different. 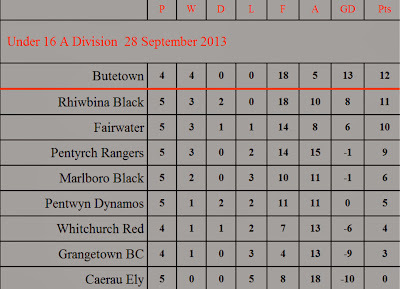 Butetown were good last year and have improved even more this season. They play much more football now and it was a strange one as they had more of the ball than us which we are not that used to. The first half was largely contested in midfield and we stood up well to their physical threat and counter attacked when we could. There were few clear cut chances for either side. for us - Huw hit over from close range, Dan hit over from the edge of the box and so did Ryan. They had a few shots from the edge of the box and several corners that threatened but we dealt with them well enough. Ryan was taken down with a bad challenge that some refs would have shown a red card for but this time it was only a yellow. AJ was looking really good for Butetown - always a handful down the right and Mike Bellew had to be at his best all game to track him. They shaded the first half but it was 0-0 at half time and the match could go either way. I noticed that it was getting close to half time and shouted to the ref asking how long was left - he thought we were playing 45 mins each way - I corrected him that it should be 40 mins but he insisted on playing 45, instead of blowing up and accounting for the extra as injury time. I commented that I wouldnt be happy if we lost in the last minute when we would have played 10 mins too long! We were better in the second half and saw more of the ball and the game became more stretched and both teams were trying to win it. They went through twice but hit shots wide - it was still on a knife edge. Jared went through and was taken down in the box but the ref refused a decent penalty claim for us. Chaz hit one from 25 yards that had the keeper stranded but it cannoned off the bar and they managed to clear. Then in the 90th minute we conceded a penalty - no arguments from me, a clear penalty. We then had a man sent off for swearing at the ref when protesting - no arguments there either , obvious straight red. They scored the pen - in off the post. My argument was that all this happened during 10 minutes additional time that shouldnt have been played - and we should have been in the car on the way home with a well deserved point from the hardest place to go in the A Division. We started well - passing the ball around really well and generally bossing it. We scored early - Dan crossing in for Ryan to head home. We continued to play and soon our second came - this was one of the best team goals we have ever scored. The ball started at the back - passing between Matthew, Huw and Josh, then into Jake the midfield, out to Ryan wide right and back into Jake. Jake played the ball forward to Chaz who weighted a beautiful pass into the path of a great run from Dan who made no mistake - into the corner off the left post as the keeper advanced. A 7 or 8 pass move that culminated in a wonderful goal. And then we stopped playing - we allowed Careau to get back into the game and they took charge for the final 15 mins of the half - scoring a very good goal themselves and it was 1-2 at half time. Caerau had lost all of their games so far this season but looked a decent side to me - a nice mix of passing and battling spirit had us hanging on a bit. They forced us back but most of their shots were from distance and either wide or over - but the game was close. Jared and Corey came on and made a real difference - their energy and will to get forward gave us back the control of the game. Jared scored a great goal from distance into the top right hand corner - and Ryan finished them off with a nicely taken chip as he went through in what looked an offside position but he played to the whistle on finished well. 1-4 flattered us but we deserved the win. 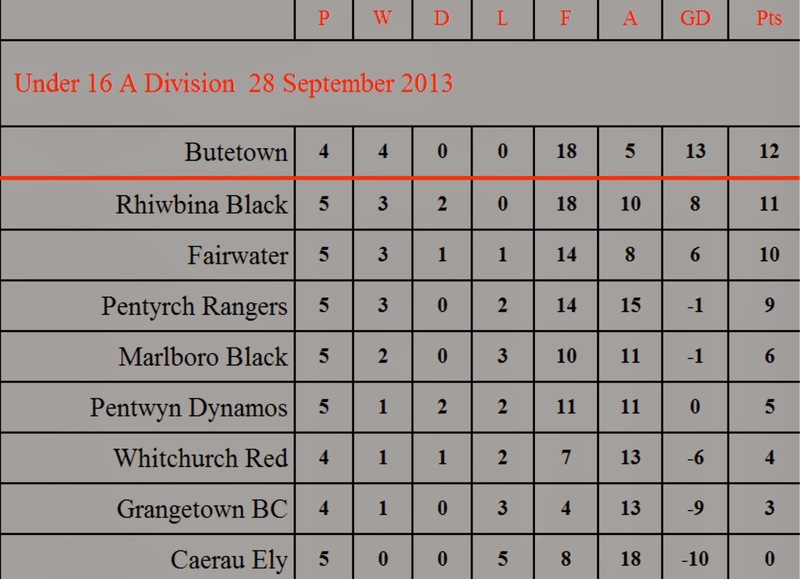 Caerau were good and the next time we meet it will be closer for sure. The morning started badly when the ref cried off at the last minute, leaving me to pick up the whistle - and the boys with no coaching from the touchline. We started off well enough though and it was a closely contested first 20 mins. We created several good moves but couldn't find that extra spark. We had an opportunity to take the lead through a penalty but missed it. The match took shape and it looked like Whitchurch were going to be tough. We took the lead through a great goal - Corey received the ball on the edge of the box, went past his man and drilled a bullet of a shot low into the bottom corner. 1-0 up at half time, not playing great but decent enough. The second half was a different matter - Whitchurch bossed it, forced us back and gradually took control of the match. We created very little and by the last 15 minutes we were hanging on. They equalised - deservedly so - through a cruel deflection - leaving Bradley rooted to the spot as he watched the ball fly past him. A poor second half performance that Whitchurch will say they should have won - and I wouldn't argue to be honest. Another hard match in which we were missing players - Jake absent and Matty still injured. We then lost Josh to injury after 15 minutes - and he was having a good game. This left us with no recognised full backs and players playing out of position. Marlboro started the better and a succession of corners at the start had us under pressure from the off. They bossed it for the first 15 minutes and we looked lacklustre and off the pace.That said - they never really created a chance and we weathered a storm of crosses and throughballs. We got a foothold and started to threaten them a little - Ryan running at them and Dan getting on the ball more. We took the lead - still slightly against the run of play - through Mike Bellew. Mike followed in Jakes footsteps from last week scoring a wonderful first goal for the club. He powered through and unleashed an unstoppable drive into the top right hand corner to put us 1 up against his old team. The game was mainly contested in the central areas and remained like that until half time and we were pleased to have the lead despite not having played anywhere near our best. We lost the game in 10 mad minutes - mistakes are costing us goals each week - players decision making is more important at thisage group and a failure to play an easy ball on the half way line, lead to us losing possession and they went through to score a very good goal - but from our point of view should never have happened had we played the way we were facing! The second goal was a good finish from Nick - who was a real thorn in our side all morning, we allowed him to turn and poke the ball into the corner. The third goal was another mistake - again bad decision making lead to attempting to dribble out from the back past an attacker, losing possession and a cross to nicks head saw us 3-1 down. All that happened in 10 minutes but we did regain some composure - Corey came on and gave us a bit more up front and we managed to get one back through Chaz - his volley deflected into the top right hand corner. We pressed them for an equaliser but they stood firm and held on for a deserved win. We did the hard bit - taking the lead when not at our best and missing several players, yet bad decision making let us down and mistakes are costing us this season. We are much stronger than we have ever been and if not for mistakes we may well have won 4 of our 5 matches - yet as it stands we have only won 1, drawn 2 and lost 2.